Martha writes to Dr. Kelly to thank him for the encouraging letter about Frances and hopes she will have the courage to stay. Martha is happy to have Dr. Kelly looking after Frances and hopes that he will come to visit the school in the fall. 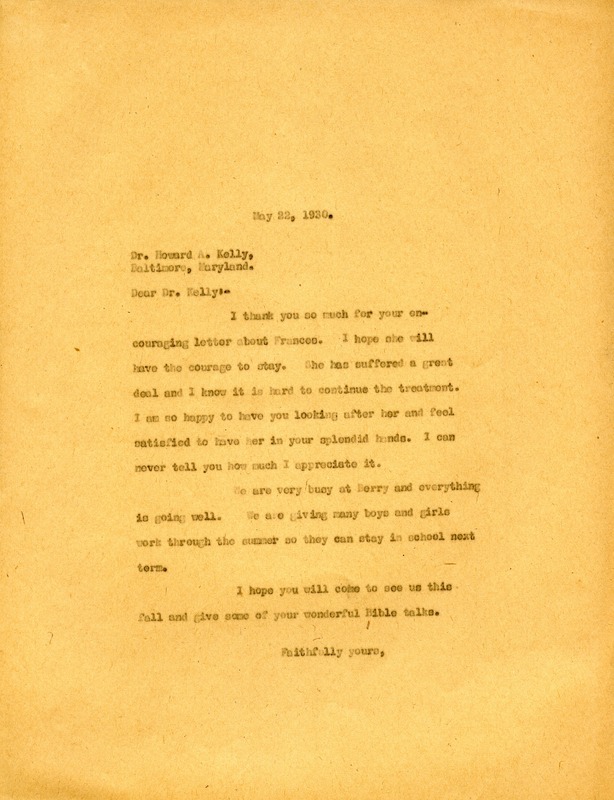 Miss Martha Berry, “Letter to Howard Kelly from Martha Berry.” Martha Berry Digital Archive. Eds. Schlitz, Stephanie A., Aaron Jackson, et al. Mount Berry: Berry College, 2013. accessed April 25, 2019, https://mbda.berry.edu/items/show/13061.